Home How To Guides What is vprot.exe error and how to remove it from task manager. What is vprot.exe error and how to remove it from task manager. 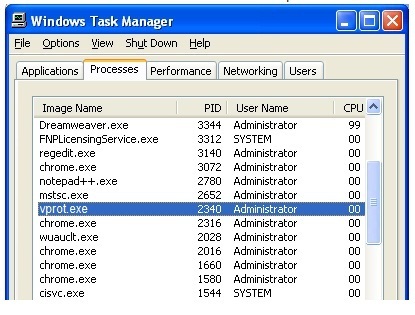 Remove vprot.exe from task manager: with increase in hardware configurations more powerful hardware is coming everyday. Capable of running many applications at same time. With more and more applications threat to your operating system and hardware is increased. To protect your operating system many antivirus like AVG, Norton etc are there. When we install some software or program in our computer its file are stored in system. Some of these files keep on running in backdrop of our pc. It doesn’t matter what software or program we are using these files keeps on running and occupies space and consume RAM also. Sometimes they enhances the performance of operating system and some times lowers down. In this article we are going you tell about one such application vprot.exe. What is vprot.exe, how to fix and remove it from your task manager. Many times you see some applications running and you doesn’t remember anything about these applications. You fears that these could be malware, bugs or viruses that can cause threat to your personal information. One such program is vprot.exe. being a .exe file means it is executable that can cause changes to your operating system. Most of us fears that it can cause harm or consume too much memory. If your one of them then read this article carefully. I have covered most of the things about what is vprot.exe, how to fix or remove it from your task manager and does it harm your system or not. Vprot.exe also called as vprotect application is an executable file in your windows. Vprotect application or Vprot.exe are part of AVG toolbar. Right-click on the task manager. Then select open file location. Right-click on vprot file and select properties. Here you can get its location in your system. vrot.exe location: located in sub folder c:\program files. file size: same file size in all windows about: 1,152,152 bytes. It is not windows core file. It can monitor applications and is not visible. As per the technical security rating it is 36% dangerous to your operating system. NOTE: always run .exe files from trusted developers only. these files are executed by system and can cause harm or security threats. Sometimes you can get an error while browsing or computer start up. So either you reinstall your AVG toolbar or remove it to fix the problem. This will install latest version of avg toolbar. After going through details about vprot.exe our last step is to fix or remove it from task manager. given below is detailed procedure about how you can fix vprot.exe. As explained above vprot.exe is a file from AVG toolbar. So to remove vprot.exe you need to uninstall AVG toolbar from your system. This will automatically remove vprot.exe file along with AVG toolbar and makes secure search. Once you have clocked on uninstall follow the instructions till procedure completes. Hope procedure given above will help you to remove of fix vprot.exe from your task manager. Method given above to fix vprot.exe error will be same for all windows xp/vista/7/8 operating system. After going through above post you will definitely get the idea about what is vprot.exe and how to fix its error.